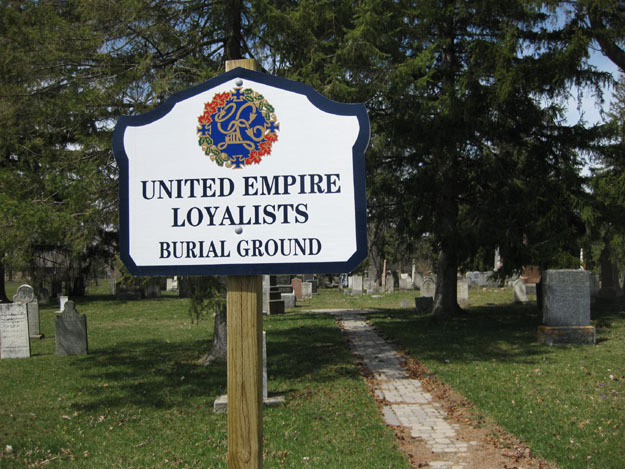 2005 : In 2005, Grand River Branch applied to Dominion for a grant from the Project 2014 Special Funds for the purpose of erecting signs in selected cemeteries in the Grand River Regions where known loyalists are buried. 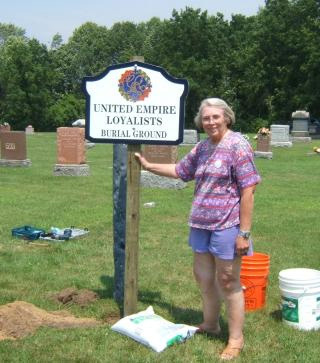 We received a grant of $450.00 and after some initial difficulty regarding the design, the project came to a happy conclusion in the summer of 2005 with signs erected in Old Woodhouse, Old Windham and Vittoria Baptist Cemeteries. The committee is planning to make an application again this year with the intent of erecting further signs throughout the region. 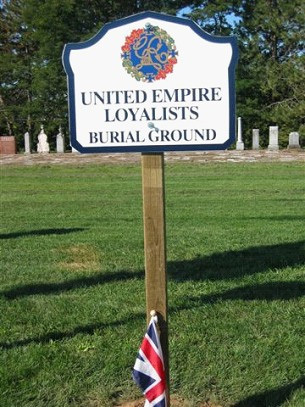 2006 : For the second year, Grand River Branch has been actively engaged in marking the burial places of Loyalist Ancestors in the Grand River Region. Largely through the work of Marilyn Haslinger and Cathy and Don Thompson, we have been able to erect plaques in throughout the area. where Loyalist Ancestors are buried. It is anticipated that as we erect more plaques that there will be fewer Loyalists in each cemetery, however it is certainly the goal of the Branch to erect as many plaques as there are cemeteries with Loyalists buried in them. Oakland Pioneer Cemetery — Daniel and Elizabeth Secord; Finlay and Tryphena (Wardell) Malcolm. St. John’s Woodhouse - Abraham and Sara (Vanderburgh) Rapalje; Ephraim Tisdale; George and Parnel (Mead) Salmon; Jonathan and Mary (Titus) Williams. McCall Fairchild Cemetery (Charlotteville) — Lieut. Donald and Elsie (Simpson) McCall; Martha (McCool) wife of John McCall. 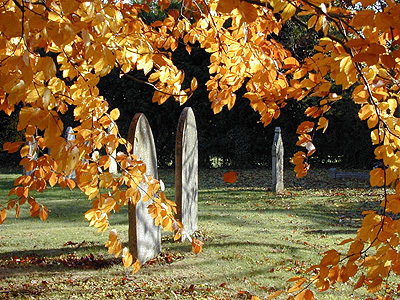 Greenwood Cemetery — Haviland – Waterford Job and Elizabeth Slaght; Capt John and Sara (Birdsell) Haviland; William and Margaret (Walker) McCool; Abraham and Sarah (Slaght) Mesecar. 2007 : Grand River Branch continues to identify and place plaques at Loyalist Burying Grounds throughout the Grand River Region. Our Branch meeting of June 17 was held at the Port Ryerse Memorial Church, at which time a plaque honouring Loyalist ancestors was unveiled at the church burying ground. Strongly supported by the Branch with generous assistance from Dominion Council, members Marilyn Haslinger and Cathy and Don Thompson make the rounds armed with plaques, shovels, expertise and sweat equity. We're grateful for their time and effort! With the placement of these years’ plaques our branch has now honoured those buried in 17 cemeteries which are in the counties of Norfolk, Oxford, and Brant. 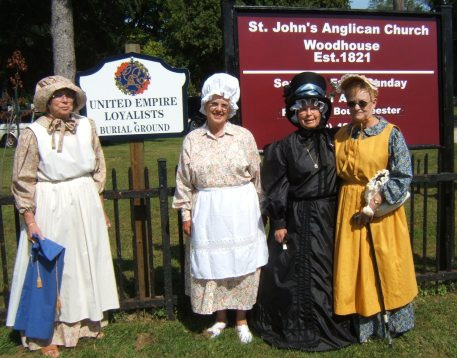 On June 22 , Grand River Branch celebrated Loyalist Day in Ontario with a very special program which included unveiling a Burying Ground Plaque at the St. Andrew's United Church in the remarkable community of Vittoria. Dominion President Peter Johnson, Vice-President Fred Hayward and Central West Regional V.P. President Bonnie Schepers were in attendance along with an enthusiastic group of devoted members and guests. Truly a memorable day for all! With the sheer number of Loyalist communities throughout Grand River Country, our work is an ongoing effort. Inspired by the determination of our Loyal ancestors, we'll continue to place these plaques as a gesture of respect and honour. We are still trying to get permission to put a plaque at the Mohawk Chapel to honour Capt. Joseph Brant but we continue to wait for responses to our letters and other correspondence. I think that we can place another 5 or 6 plaques this year and they will likely be out of Norfolk. I have attended the regular meetings and the Exec. Meetings during this year, have participated in outreach and educational programs and have had many emails requesting help and wanting information about joining our branch. I believe that it has been a good year for our branch and trust that it will continue in 2009. Grand River Branch is firmly committed to paying our respect to and acknowledging the sacrifices of the United Empire Loyalists who were instrumental in helping found our great country of Canada. We will always be indebted to these extraordinary people.